(CNN) -- The FBI announced Monday it is helping the Food and Drug Administration in its investigation of the Peanut Corporation of America, the Georgia company whose peanut products have been linked to a nationwide outbreak of salmonella poisonings. 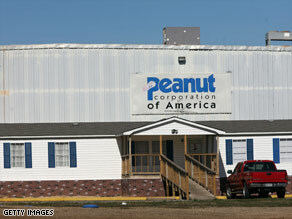 The Peanut Corporation of America is being investigated in connection with a salmonella outbreak. On January 30, the FDA's Office of Criminal Investigations opened its probe into the company, which the agency said shipped tainted products that it knew had tested positive for the bacteria. The outbreak has been linked to 575 illnesses, including eight deaths, in 43 states. "The FBI was asked to assist FDA/OCI in this matter, due to its ability to bring to bear a considerable amount of investigative resources," the FBI said in a written statement. The Blakely, Georgia, company did not immediately return a call seeking comment.